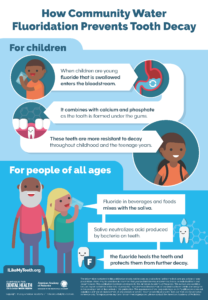 Posted January 24, 2019 & filed under Children's Oral Health and Fluoride, Facts about Fluoride. The Campaign for Dental Health (CDH) is happy to announce that the How Fluoridation Works poster and graphic have been updated with new images and are available in both Spanish and English! And now a new format is available that allows for printing of full-size, 18×24 posters! These resources compliment the How Fluoride Works video that is also available through the CDH website. How Community Water Fluoridation Prevents Tooth Decay and Cómo la Fluoración de la agua de Comunitaria Previene Caries Dental are now available for you to use and share. Please help us spread the news by forwarding this resource to colleagues, constituents, and members of your networks. This resource is free to anyone to download and print, and we encourage its widespread use!